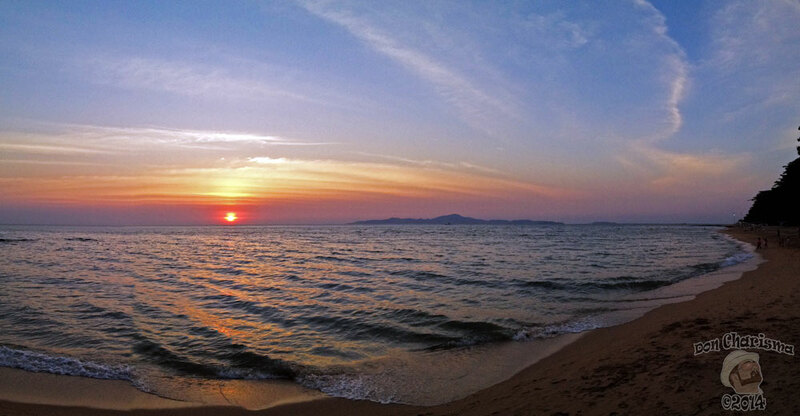 Enjoy this beach sunset panorama. It’s an iPhone panorama done on the phone with Apple’s built in pano feature … plus a little extra joy added in Photoshop. Very pretty. Would make a nice postcard. Lovely photo… I’d rather be there! Oh I agree, however, it is below freezing where I am. A few more weeks and I’ll be able to sit outside and watch the sun set! Just what I wanted to see this morning. We had 10+ inches of snow dumped on us yesterday. Thanks for taking me away. I love snow, but it does get dreary quite quickly … when you coming to visit me ? It is very beautiful. Where was that picture taken? Thanks. I took it on the beach. Wow Don, this is amazing beautiful. I would love to see this sunset in real life. Great job. You are right. I did photograph a lot sunsets here in Spain. They are beautiful too. In the spring they become more beautiful. Amazing, this is just stunning. I want to get lost in this picture and never return. Stunning. And with an iPhone?? Even more stunning. Thanks! I did enjoy it ~ a lot. Sighh … I complain to all takers of nice pic.s that I do wish they wouldn’t enhance them. ‘Raw’ photos are so much more interesting! – they have character. Beauty, too. G’wan – show us the original; bet it’s just as good! Maybe later, and actually I’ve found enhancement can bring closer to what the eye sees, the “raw” photos I often find are distorted and lack the majesty I remember with my eyes. HDR shots for instance re-introduce colours that seem to get washed out in non-HDR. Well, that’s the best defence anyone has offered. Even makes sense! I even posted another sunset today, and wrote about our conversation. The sunset this evening had one phase of this most vivid yellow. The phone camera entirely wouldn’t capture it anything like real life … So I did listen to you, and there is a valid reason, not like those dunb photoshopped photos of women who look like barbie, but in real life aren’t that attractive … So photoshopped doesn’t mean totally inauthentic, it can be used for white magic not just black ! WOW!! Gorgeous!!! Nice job, Don! The picture is very nice and I am so charmed that I imagine to be near this beach dreaming.